Conor McGregor says he broke his foot before his defeat by Khabib Nurmagomedov at UFC 229. The Irishman tapped out in the fourth round of the October 2018 bout in Las Vegas, on his return to the octagon after a 693-day absence. After the fight, McGregor, 30, said he had made errors at a "crucial time" and felt he had been beaten fair and square by the Russian. But he said on Thursday: "I broke my foot three weeks out from the bout." Referencing the post-bout brawl that followed, he added: "I still marched forward however, and also landed the final blows of the night. "I am happy with how the contest went and the lessons learned." His revelation on Twitter came after a fan asked why he had appeared flatfooted during the fight. 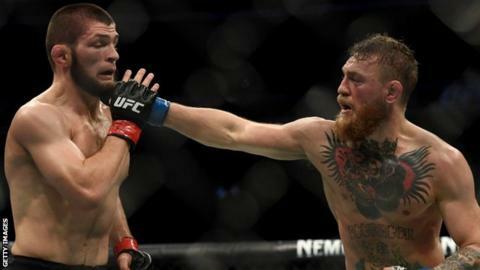 Following the post-bout brawl, both fighters were fined and handed suspensions - McGregor for six months and Nurmagomedov for nine. McGregor revealed in March that he had retired from MMA but earlier this month, in series of now-deleted tweets branded "unacceptable" by the UFC, he appeared to challenge Nurmagomedov to another fight.